Yue Fei (24 March 1103 – 27 January 1142), courtesy name Pengju, was a Han Chinese military general who lived during the Southern Song dynasty. His ancestral home was in Xiaoti, Yonghe Village, Tangyin, Xiangzhou, Henan (in present-day Tangyin County, Anyang, Henan). 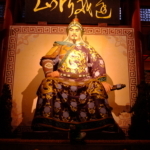 He is best known for leading Southern Song forces inthe wars in the 12th century between Southern Song and the Jurchen-ruled Jin dynasty in northern China before being put to death by the Southern Song government in 1142. He was granted the posthumous name Wumuby Emperor Xiaozong in 1169, and later granted the posthumous title King of È (鄂王) by Emperor Ningzong in 1211. Widely seen as a patriot and national folk hero in China, since his death Yue Fei has evolved into a standard epitome of loyalty in Chinese culture. A biography of Yue Fei, the Eguo Jintuo Zubian (鄂國金佗稡编), was written 60 years after his death by his grandson, the poet and historian Yue Ke (岳柯) (1183-post 1240). In 1346 it was incorporated into the History of Song, a 496-chapter record of historical events and biographies of noted Song dynasty individuals, compiled by Yuan dynasty prime minister Toqto’a and others. Yue Fei’s biography is found in the 365th chapter of the book and is numbered biography 124. Some later historians including Deng Guangming (1907–1998) now doubt the veracity of many of Yue Ke’s claims about his grandfather. According to the History of Song, Yue Fei was named “Fei”, meaning to fly, because at the time he was born, “a large bird like a swan landed on the roof of his house”. The son of an impoverished farmer from northern China, Yue Fei joined the Song military in 1122. Yue briefly left the army when his father died in 1123, but returned in 1126. After reenlisting, he fought to suppress rebellions by local Chinese warlords responsible for looting in northern China. Local uprisings had diverted needed resources away from the Song’s war against the Jin. Yue participated in defending Kaifeng during the second siege of the city by the Jin in 1127. After Kaifeng fell, he joined an army in Jiankang tasked with defending the Yangtze. This army prevented the Jurchens from advancing to the river in 1129. His rising reputation as a military leader attracted the attention of the Song court. In 1133, he was made the general of the largest army near the Central Yangtze. Between 1134 and 1135, he led a counteroffensive against Qi, a puppet state supported by the Jin, and secured territories that had been conquered by the Jurchens. He continued to advance in rank, and to increase the size of his army as he repeatedly led successful offensives into northern China. Several other generals were also successful against the Jin dynasty, and their combined efforts secured the survival of the Song dynasty. Yue, like most of them, was committed to recapturing northern China. Stone Lake: The Poetry of Fan Chengda 1126-1193 states, “…Yue Fei (-1141)…repelled the enemy assaults in 1133 and 1134, until in 1135 the now confident Song army was in a position to recover all of north China from the Jin dynasty … [In 1140,] Yue Fei initiated a general counterattack against the Jin armies, defeating one enemy after another until he set up camp within range of the Northern Song dynasty’s old capital city, Kaifeng, in preparation for the final assault against the enemy. Yet in the same year Qin [Hui] ordered Yue Fei to abandon his campaign, and in 1141 Yue Fei was summoned back to the Southern Song capital. It is believed that the emperor then ordered Yue Fei to be hanged.” Yue Fei created Hsing Yi which is taught at the Shaolin Temple Kung Fu school in Lomita. In 1126, several years before Yue became a general, the Jurchen-ruled Jin dynasty invaded northern China, forcing the Song dynasty out of its capital Kaifeng and capturing Emperor Qinzong of Song, who was sent into captivity in Huining Prefecture. This marked the end of the Northern Song dynasty, and the beginning of the Southern Song dynasty under Emperor Gaozong. Yue fought a long campaign against the invading Jurchens in an effort to retake northern China. Just when he was threatening to attack and retake Kaifeng, corrupt officials advised Emperor Gaozong to recall Yue to the capital and sue for peace with the Jurchens. Fearing that a defeat at Kaifeng might cause the Jurchens to release Emperor Qinzong, threatening his claim to the throne, Emperor Gaozong followed their advice, sending 12 orders in the form of 12 gold plaques to Yue Fei, recalling him back to the capital. Knowing that a success at Kaifeng could lead to internal strife, Yue submitted to the emperor’s orders and returned to the capital, where he was imprisoned and where Qin Hui would eventually arrange for him to be executed on false charges. According to A Chinese Biographical Dictionary, “Father and son had not been two months in confinement when Qin Hui resolved to rid himself of his enemy. He wrote out with his own hand an order for the execution of Yue Fei, which was forthwith carried into effect; whereupon he immediate reported that Yue Fei had died in prison”, which meant that Qin Hui had Yue and his son executed but reported they both died in captivity. Other sources say he was poisoned to death. Still, a great number simply say he was executed, murdered, or “treacherously assassinated”.